While stocks, and with a notable delay bonds, were happy to run with Powell's dovish reversal on Wednesday, one key market - arguably the most important one for financial conditions when it comes to the broader economy - has refused to respond. Earlier today, instead of reacting to what has been interpreted as the Fed Chair's "dovish repricing" of future rate hike expectations, 3 month USD Libor jumped over 3 basis points to 2.73813%, the highest level in more than ten years. This was biggest daily jump in 3M Libor since March, and the second highest Libor increase of 2018. As a result, dollar funding conditions as measured by Libor-OIS have also tightened notably, as the spread widened to 36bp from 33.8bp prior session, and is once again approaching the levels seen during the spike earlier this year. 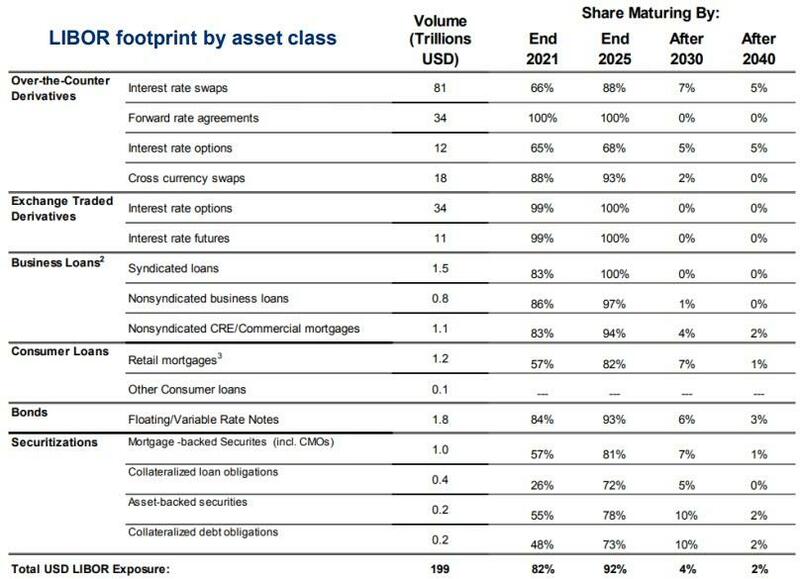 The reason why rising Libor remains a major risk to financial conditions, is because as the table below shows, its footprint can be found everywhere, from OTC interest rate swaps, to leveraged loans - considered by many as the locus of the next credit crisis - to retail mortgages, to complex securitizations. According to the TBAC, just about $200 trillion in instruments are exposed to Libor's interest rate footprint. Most affected by this ongoing rise may be the bond market, which has also been hit with the double whammy of tumbling oil, which earlier today dipped below $50/barrel, a price widely seen as a "red-line" for junk bond investors, below which some may sell their exposure indiscriminately. And since energy is one of the largest components of the junk bond index, it is only a matter of time before contagion spread from oil, through highly leveraged energy producers to the rest of the market. In any case, the ongoing rise in Libor which absent a reversal soon will result in even tighter financial conditions and higher interest expense on trillions in floating rate debt, Bloomberg's Alex Harris notes that those traders who took the "dovish" Powell at his word, and pared Fed 2019 rate-hike bets to just barely one "may be getting way ahead of themselves." The reason: "apart from inflationary pressures and a strong jobs market, the need for extra policy firepower is another compelling reason for the U.S. central bank to stay the course. As such, expect the Dec 18-19 Eurodollar spread to fade some of the overnight narrowing that has taken it to a 10-month low." As Harris notes, the key event here was the central bankers' meeting at Sintra over the summer where Powell acknowledged that central banks would have less ammunition to fight the next downturn with rates still so close to zero. So will 2.5%-2.75% be enough of a springboard from which to cut rates during the next downturn? The market seems to think so; whether Powell agrees will be revealed in the Fed's next projection materials in December where unless the "dots" are slashed, the market will be in for a very painful hangover going into the holiday week.